External Sleeve Choke Valve is widely used on the well and often equipped on the choke manifold, kill manifold, x-mas tree, pipe line for oil production and injection, well drilling, well testing operation. Especially for the severe working condition. The external sleeve type trim uses a flow sleeve moving over the outside of a ported cage to control flow. Designed for high pressure drops and severe erosive flow with sand combination Designed especially for high pressure drops and severe erosive flow with sand combination. 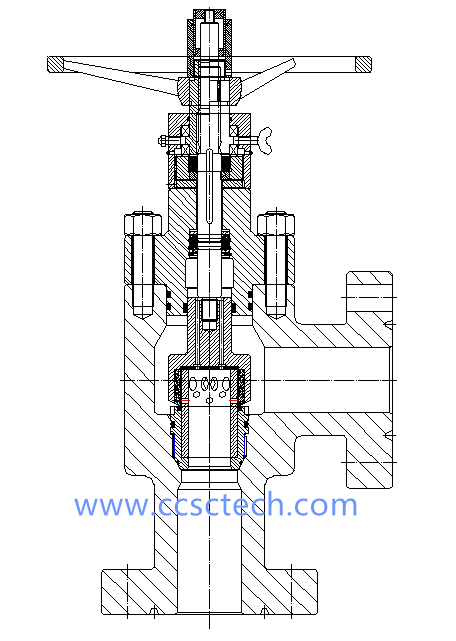 These choke Valves are designed, manufactured in accordance with API Spec. 6A and easy for operation and maintenance and widely used in many oilfields. And earned a high reputation. ●Versatile for onshore and offshore applications. ●Forged or cast body construction. ●Body materials from carbon steel, stainless steel, duplex stainless steel and corrosion resistant alloy. ●Pressure balancing plug design reduces operating torque. ●Barrel Indicator calibrated in 4/64” ‘Bean Size’. ●Various Inlet & Outlet distances can be kept as per client requirement. ●Rated Working Pressure: 2,000psi ~ 20,000psi and ANSI classes up to 4500.